Cornbread salad? Sounds a little strange, right? Think what you like, but WOW is this delicious!! I discovered this yummy recipe from Harrington House who directed me to Cherry Hill Cottage. A huge THANK YOU to both of these ladies for the recipe!!! Mix this all together and enjoy!! But, if you mix it all together, cover, and wait about 24 hours, the taste gets even BETTER!!!! That looks quite interesting- almost like a stuffing salad! I think I will try this next week. This looks delicious! How big are the pans that you cook the cornbread in? Thanks for the reciepe. I have had this before and it is quite yummy! I think I just might try this on my husband next week and see what he thinks. I haven't cooked with cornbread before but I love it! Some of the strangest sounding combinations are the most tasty! I love cornbread! Thanks for posting the recipe. What an interesting salad!It sure looks delicious.I'd love to guide our readers to your site if you won't mind.Just add your choice of foodista widget to this post and it's all set, Thanks! 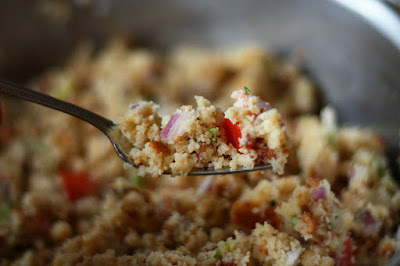 We LOVE cornbread salad! Thanks for the reminder that I need to fix it.